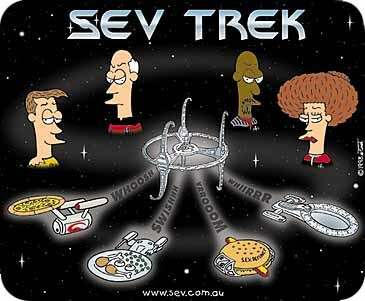 The Sev Trek Mousepad features a full colour print of the four captains and five sevships of Sev Trek. It is covered with a PVC Surface - a hard plastic surface (they're a much better quality than those furry, material mousepads). The mouse runs easily over the pad, but has enough grip that the mouse doesn't slip.